Home › You May Mini Led Under Cabinet Light 10 Leds Night Light Battery Powered Pir ..
You May Mini Led Under Cabinet Light 10 Leds Night Light Battery Powered Pir ..
Color: Batteries Powered This is a wireless PIR motion sensor under cabinet led lights, using advancedinfrared technology, the LED light is quite sensitive and bright. Withinfrared sensor, the light will turn on or off automatically at night or adark place without sound and switch control. It's designed to provide people with convenience in the dark, which is idealfor bedroom, baby room, closet, cabinet, corridor, workshop, basement, garage,stairwell, oil depots, door, drawer , garage entrances and other places. Easyto install without tools, Take down the magnetic stripe, tear off theprotective layer, stick the foam tape, and aim the back of the lamp at theprepared magnetic stripe. It allows you to illuminate any area without thehassle of wiring or having to find a switch. Environment protective material,flexibility and good brightness. Long operating life. 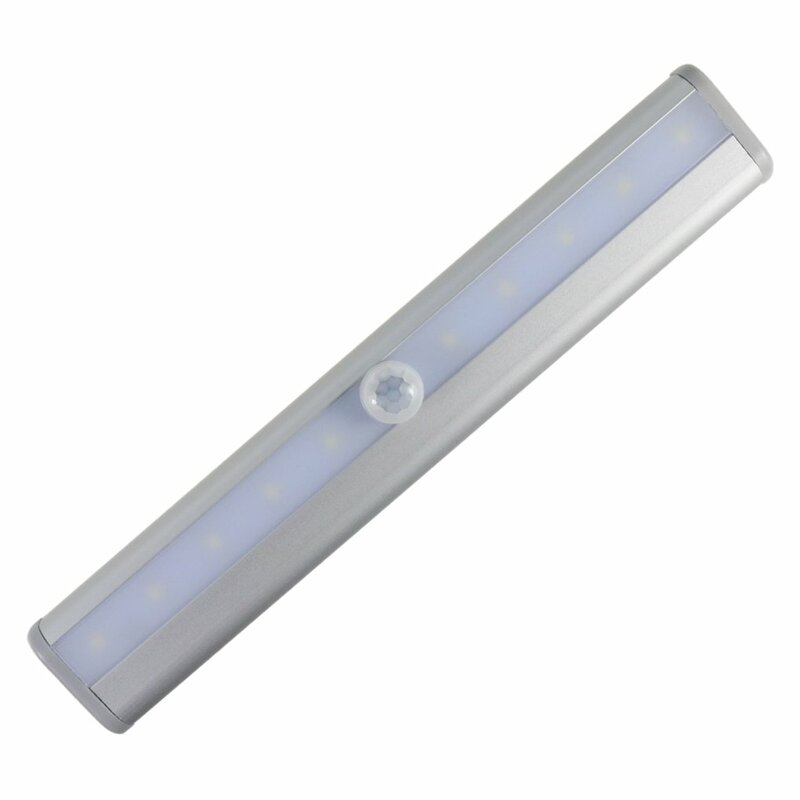 Specifications: Sensitivity range: about 3 meter Distance Sensor Range: 120 degrees LED Qty: 10 LED Light color: White LED life: 50,000 hours or more Luminance: 80lm Size: 7.5 x 1.2 x 0.6inch (LxWxH) Material: Aluminum + ABS Light weight: 114g / 4.0oz Powered by 4 X AAA batteries (not included) Package: 1 x 10 LEDs IR Sensor Closet light 1 x User manual 1 Year Replacement Warranty, 30 Days Money Back Guarantee Notes: This light is not waterproof, and do not install in place with rain, heavyhumidity. The LED light won't light up during day time when it is bright enough. Don'tactivated the LED night lights too close. The light of one night light maycaused. There's transparent film on the surface to protect the LED light. If the light is dim or the sensor is not sensitive enough, it means it need tonew batteries.